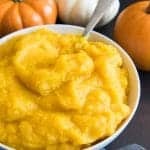 This homemade pumpkin puree recipe is easy and rewarding and you will end up with lots of wonderful, fresh pumpkin puree for all your Fall baking needs! Think pies! Breads! Cookies & more! Heat oven to 350 and line a baking sheet with parchment paper. Slice the pumpkin (or pumpkins) in half. 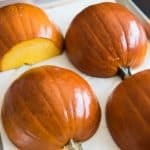 The stem can be tricky to cut through, so you might want to slice the top off the pumpkin so you don't have to bother with the stem. Scrape out all the guts and seeds using a large spoon. You can clean and save the seeds for roasting, if you like. 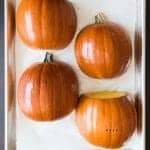 Place the pumpkin halves face-down on the parchment-lined baking sheet and roast uncovered for 50-60 minutes in the preheated oven, until fork-tender. You may need more time if your pumpkins are a bit bigger. The skin will darken to a deep orange and you should have no trouble getting a fork in and out. If in doubt, keep roasting a bit longer - it won't hurt the pumpkin. Let the roasted pumpkin cool for 10 minutes, then use a large spoon to scrape the pumpkin flesh off the skin of the pumpkin, or just peel the skin off with your hands. 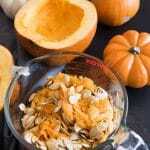 Place chunks of roasted pumpkin into a food processor or blender and process for 2 to 4 minutes until completely smooth. 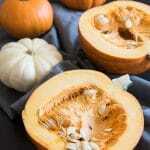 You will need to tamp the pumpkin down a couple of times while pureeing in order to make sure it all gets processed. Use within 3 days or freeze in large freezer-safe bags. You don't want to wait until the pumpkin is completely cool to do this though, because it comes off much better while the pumpkin is still hot.